ditto. You should see my cubicle. i should go through my NU pictures. is it really possible that we don't have a picture of at least one of your places?? Okay, I oughta take a picture of the other side of my cubicle, where all the stuff is haphazardly stacked so that the space you see above can be used for work. 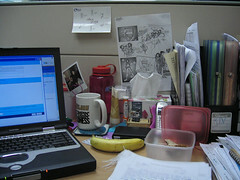 I'm not a desk goddess, really!! kk --- I hope you find something! I know I have hardly any pics of my time at NU at all. I guess we were too busy, er, having fun? To remember to take pictures :) Plus, hey, no cheap compact digital cameras and cameraphones in our time! Ha ha.